Historically, I am not a crier. Not at Hallmark commercials. Not at "The Notebook." And it was an awesome day. Filled with lots of teary-eyed moments. You see, my co-worker's daughter passed away unexpectedly when she was just 20 months old. This recent day would have been her 4th birthday. In an effort to make the day easier for my co-worker, my team rallied together to pull off the exceptional. We all wore purple, the color of the baby's birthstone. We had a cake, balloons, flowers, and a little girl's birthday card we had all signed. 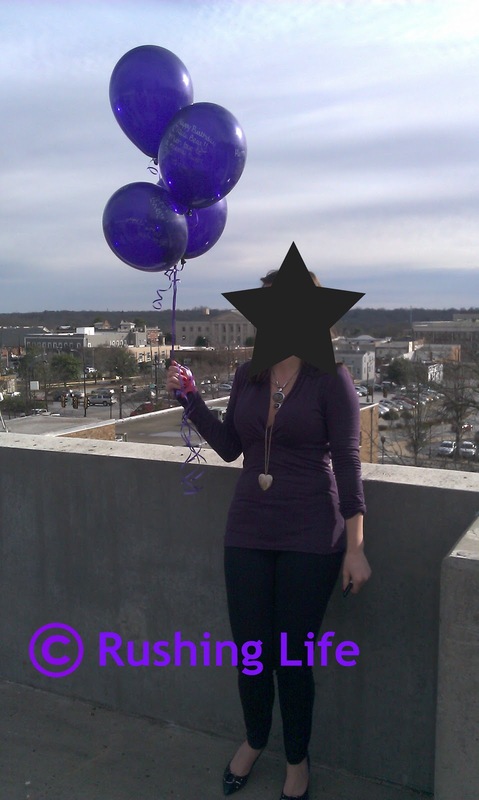 And at 4pm, about 15 of us trudged to the rooftop of an adjacent parking garage and released 4 balloons for the baby's 4th birthday. We had written birthday messages on all of them. We stood in the gorgeous sunshine of a warm February afternoon and watched them float away until we could not watch them anymore. It was a day full of reminders. That I work for an awesome company full of amazing, good-hearted, and kind people. We are definitely a team in all the sense of the word. It was a day that I felt more grateful for Bimmer than usual. I try not to take any moments for granted with my daughter, and I certainly didn't that day. When several girls went out for drinks after work, I declined and said I needed to go pick up my baby. She understood with every bone in her body. I can't even begin to fathom her loss. I know she has gone through tremendous pain and grief. She is an intensely strong woman. And while her daughter is no longer with her physically, she is still one of the most inspiring mothers I know. Well you got this sap crying! What a wonderful memorial for your co-worker and her daughter. Hearing about people who lose children always gets me! That was a great thing you all did.